I’d been looking forward to my return to Chicago for some time, not least because the city has some outstanding coffee. I’d already chosen my hotel, the Freehand, because it meant I’d have the excellent Café Integral waiting for me in the lobby each morning. I’d even scouted possible stops along my route to the office, but what I wasn’t expecting, when I sauntered in on Monday, was to find excellent coffee on the premises. The Infuse Coffee & Tea Bar had only been open three weeks when I arrived. It’s located in River North Point, on the north bank of the Chicago River, right next to the Merchandise Mart. If you use the main (riverside) entrance, you can’t really miss Infuse, which is at the back of the lobby on the left-hand side, before the escalators. It’s a simple affair, an open counter running along the left-hand wall. The till’s in the middle, with a chiller cabinet to the right holding cakes, breakfast goodies, sandwiches and salads, all of which are pre-prepared, so you can just grab them and go. Alternatively, the sandwiches can be heated in the oven behind the counter. Similarly, if you are in a hurry when it comes to coffee, there are two options on bulk-brew, both from different roasters, which are planned to change every month. During my visit, they were the Spice Island blend from Metropolis Coffee Company and a Guatemalan single-origin from Passion House Coffee Roasters, both from Chicago. 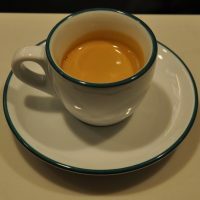 Alternatively, linger and have something from the espresso machine, a bright-red La Marzocco FB80, which, I was told, was the 10,000th ever made! There’s a fairly standard menu, which includes a cortado option, with The Sermon espresso blend from Santa Cruz’s Verve doing the honours. Alternatively, there’s decaf from Milwaukee’s Colectivo. I started with a cappuccino in my SoL Cup, since I had to run back to the office. However, I popped back in the afternoon to try The Sermon espresso on its own. In milk, it was awesome, really rich and well-balanced. On its own, Pete, my barista, decided to pull me two shots, one slightly “long” at 30 seconds and the other at 25 seconds, which is closer to the recommended recipe. This made quite a difference to the taste: both were excellent, but the longer shot was a little more rounded in my opinion, while the shorter one was sharper, with a touch more acidity. While the Infuse Coffee & Tea Bar is a one-of-a-kind, it is part of the Infuse Group which offers managed coffee bars, etc, in hotels, offices and similar spaces. There’s also a sibling coffee shop, Fairgrounds Coffee, which has recently opened in Chicago’s Wicker Park. September 13th: popped back the following day and went through the filter options. Both were excellent, but the Passion House Guatemalan was particularly fine, a very subtle, delicate coffee. I also had an awesome morning bun. In the afternoon. I am such a rebel. August 2018: I was back in the office for another week-long meeting before my Midwest road trip. This time I stayed in the hotel above the office, making Infuse my go-to coffee stop on a daily basis. January 2019: September’s visit was such a success that when I returned in January for another meeting, I stayed in the hotel above the office again, making daily visits to Infuse. That and it was – 20°C outside (daytime high!) and I didn’t want to have to leave the building! This entry was posted in Breakfast, Cake, Chicago, Coffee Shops, Laptop Friendly, Lunch, Offices, Sandwiches, Saturday Short and tagged Chicago2018, include, Metropolis, Passion House by Brian Williams. Bookmark the permalink.